An up to $500 casino bonus would be a nice way to start the new year, wouldn't it? 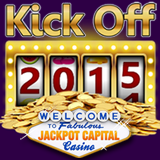 Well then, get over to Jackpot Capital Casino where they're kicking off 2015 with a $100,000 casino bonus giveaway. The online casino, popular all over the world, is giving away $10,000 in weekly scoreboard prizes and random prize draws totaling $40,000. When you play at Jackpot Capital you automatically earn points just by playing. All players are ranked according to their points on a scoreboard. Every week until February 16, if you're one of the top 200 players you'll get a bonus -- up to $500 each! But it's not just frequent players that can win. This giveaway is set up so that everyone has a chance at some New Year bonuses. Every Friday lots of randomly selected players will get Bonus Boost bonuses up to $150 each. Jackpot Capital Casino has hundreds of games from Realtime Gaming and many of its most popular slots as well as Blackjack and Keno are available in the mobile casino (jackpotcapital.eu/mobile in a mobile browser). Mobile Keno has also been very popular since it launch just recently.